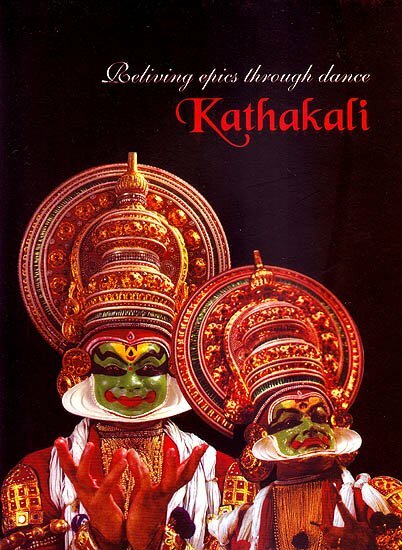 Kathakali is the story dance from the southern state of Kerala. Kathakali literally means ‘Katha’ story and ‘Kalt a dance or a performance. It is a composite art where different actor-dancers take different roles. The stories are usually from the Indian epics Ramayana and Mahabharata. Kathakali is a very majestic art and when you see the costumes you realize how much thought and how much aesthetic values have gone into its making. The entire idea is of total theatre with acting, music both vocal and instrumental and also the color psychology in costumes playing equal roles. A performance starts by lighting of the ceremonial lamp. It has just two wicks – one wick is towards the audience and the other towards the stage. It signifies that the light of knowledge must spread not only to the actors but also to the audience. The message is very simple. It is the victory of good over ever. Kathakali can be described as the “theatre of imagination where demons and good human beings clash in die realm of the imagination, where the good human beings are eventually victorious. Historically, Kathakali is the end product to a long line of theatrical practices. The roots to Kathakali are to be found in The Kutiyattam, the Sanskrit drama which has been the preserve of the Chakkyar Brahmin community for almost 2000 years. There are references to be found in the Southern epic Shilappadikaram which describes a dance that a Chakkyar presented in honor 01 the victorious king. The present form of Kutiyattam was finalized in 1000 A.D. together with the Chakkyar’s art flourished Nangyar Kuttu performed by women. In the 16th century we come to the next phase in the development of that krishnattam which presents the Krishna cycle in eight days. Later in the 17th century developed the Ramanattam which presents the Rama cycle. Ramanattam which is no more practiced evolved as the Kathakali we know today. Kathakali make up is the most complicated and the most colorful of all the make up in Indian classical dance styles. The make up is called Aharyaabhinya and it follows the color psychology. It is to be noted that until a few decades ago kathakali was practiced only by men even the women characters begin enacted by men. The Kathakali costume is very bulky. The actor dancer wears superbly crafted head gear called kireetam. The size and shape of the kireetam vary according to the type of the role. Form the waist downwards layers of cloth are gathered together to create a billowing skirt. Wooden ornaments coated with golden covering and inlaid with colorful stones complete the constume. The facial coloring is prepared by grinding natural powders with coconut oil. The eyes and eyebrows are very heavily highlighted. Round the cheeks extending up to the chin an outline is made of a paste the Chutti made up of lime and rice powder which is bound together to form different patterns for different types of characters excepting women and some ordinary male characters. A tradition Kathakali performance starts late in the evening by playing of the orchestra which is considered to be auspicious. It also announces to the villagers around that a performance is going to take place. The orchestra for almost three centuries. The lead singer has a metal disc in his hands which is called chengala. There is the secondary singer who has heavy cymbals is his hands which are called yeletalam. The cylindrical drum the chendra is played by two sticks. The maddalam which is a very ancient percussion instrument is played by adding some coating on the fingers of the right hand in order to give resonance. The mode of singing is Sopana Sangitam indigenous to Kerala. Every Kathakali artist likes to perform in Kalyana Sougandhikam a very famous Kathakali Attakatha. Is represents a popular story from the epic Mahabharata. The five brothers Pandavas have been banished to the forest. They have taken their wife Draupadi along with them. The second brother Bhim sen and Draupadi are walking around the deep forest. They find a beautiful flower fallen on their way. Draupadi enchanted by the fantastic flower and its fragrance requests Bhim en to get some more flowers to make a garland. Bhim Sen rushes to get the flower in that forest lives the great monkey God Hanuman who is supposed to be Pawan Putra son of Vayu as is Bhim Sen also. Hence Hanuman becomes the elder brother of Bhima. When Hanuman sees his younger brother rushing forth knowing his mind he plans to tease him. He being a great devotee of Lord Rama with his blessings turns into an old monkey who seems to be so old Hanuman Bhima orders him to move out of his way but Hanuman pleads that he cannot even move an inch as he is weak and old. He requests Bhim Sen to cross over him but Bhim Sen say that he cannot do that because his won elder brother Hanuman is also a monkey Hanuman asks him to lift him hp by his tall and throw him out. Bhima tries to lift Hanuman by his tall but is unable to do so. Ultimately he realizes that the old monkey is his own elder brother hanuman. Superb Nayanabhinaya is one of the great weapons in the art of Kathakali. This piece showcases the greatest Kathakali actor dancer late Kalamandalam Krishnan Nair. Here he is enacting his very favorite role Nala from Nala Charitam one of the most popular Kathakali Attakathas. Nala is meeting his new bride Damayanti for his first time. He is enchanted by her great beauty but like any new bride Damayanti is feeling very shy. With superb Nayanabhinaya Nala cajoles her pleads with her to come closer. Damayanti’s role is being enacted by Margi Vijayan. The other characteristic of Kathakali performances is its very beginning. Each character appears on the stage behind a huge curtain which is held by two men. This curtain is called Tereshila or the curtain which is the most fabulous concept of Kathakali technique. It is called Teranokku or the curtain look. The dancer actor sometime yells and makes frightening noises the way he shakes the curtain and takes it up gives the audience an idea of what sort of a character is going to appear and this curtain look is one of the most thrilling moments of a Kathakali performances. In this excerpt from Dussanssana Vadham we will see Teranokku of Dussassana. Then there is a brief between Dussassana and Bhima. The story is from Mahabharata. Pootana Moksham represents the killing of the demoness pootana by the baby Lord Krishna. Pootana is a demoness sent by king Kamsa to kill baby Krishna. Disguised as a beautiful woman she approaches Krishna. She is memerised by Krishna’s divine beauty. The piece reflects the shifting moods of the demoness who is frightened by the thought of Kamsa if she does not accomplish her mission at the same time the woman in her does not wish to kill the charming child.